Full zero and air test to verify the dissolved oxygen sensor is fit for purpose. Prevents a faulty sensor being fitted to a vessel. Convenient: One unit to test and polarize. Universal: Can be used with all popular makes of polarographic sensors. Battery Powered: Can be used in the laboratory or production areas. Simple to Use: Single button press displays nA, °C, Battery Volts. 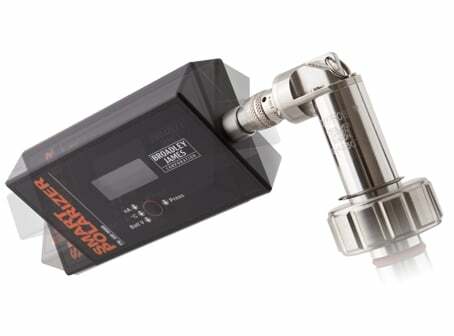 The Broadley-James Smart Polarizer conditions a polarographic dissolved oxygen sensor, so that it is ready to use and also allows the user to test the sensor to ensure it is operating correctly, before it is placed in the vessel. When the dissolved oxygen sensor is connected to the Smart Polarizer a polarizing voltage is automatically applied to the sensor. The unit displays the raw nA output from the sensor, the temperature from the sensor’s internal temperature compensator and the unit’s battery voltage. This allows the user to test the dissolved oxygen sensor raw output (nA) in air (100%) and in zero oxygen conditions (0%).